The Holy Roman Empire is a particularly misleading name for Europe's largest collective of kingdoms and fiefdoms, regardless which way one looks at it. For starters, it is the Byzantine Empire that truly carries on the legacy of the ancient Romans, and the notion that the Kaiser (the Germanic name for "Emperor") truly serves the Roman Catholic Church is presently quite laughable.A great rift in opinion exists between Kaiser Henry IV and Pope Gregory VII as to the legitimacy of the Papacy's recent move to do away with secular investiture, a change of law that has taken away all of the Kaiser's power over the Catholic Church. How the Kaiser should react to this is undoubtedly the biggest dilemma facing the Holy Roman Empire at present. When a ruler of nations allows a man of the cloth to dictate what he can and can't do, he sets a bad precedent. Of course, if he leads his people into open conflict with the church itself, he is arguably setting an even worse one.With both extremes looking like perilous choices the Kaiser will need to find the best middle ground he can, very much the same situation he faces when looking at his borders. The Empire itself is Europe's middle ground, centrally located, with opportunities to expand in almost every direction, but also potential competition to come with each opportunity. It is a far cry from the days of Charlemagne when all of Western Europe answered to the Emperor. 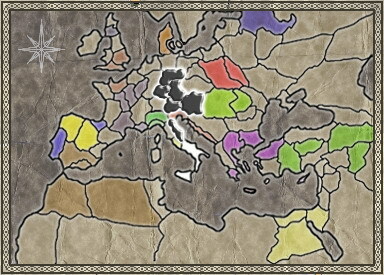 Now France is a separate entity, Italy has become a formidable group of city states, the Danes block the route into Scandinavia and the kingdoms to the east are more of a threat than a place to lay claim to.Should the Kaiser successfully deal with the dissent that lingers within the Reich at present, there seems no reason the Reich cannot consolidate and expand into something to rival the first Roman Empire... Though this time it won't be a simple matter of bettering the barbarians. Impressive looking knights, well protected by armour and armed with a two-handed sword. These desperate men are armed with a massive two-handed sword and thick armour. Lacks the late period professional armies of England and France. A Printing Press improves both trade and happiness throughout its host city. A Teutonic Knights' Minor Chapter House allows the recruitment of Teutonic knights.